Travis Heights Elementary School > District News > Online Registration is Open! New Students: Find more information on our Registration Information Page. ALL RETURNING STUDENTS MUST REGISTER ONLINE: For parents registering students returning to AISD, a Parent Cloud account must be created before you can access the Online Registration system. 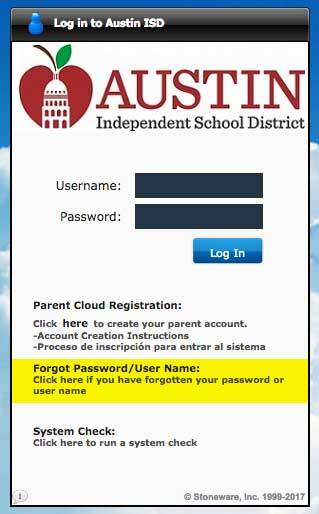 To create a Parent Cloud account, visit my.austinisd.org. IF YOU HAVE FORGOTTEN YOUR USERNAME/PASSWORD: You will have to click on the “forgot username/ password” link under the password box. Where your username will be sent to an email on file, if you cannot access the email address on file you will have to contact the parent help line at 512-414-9187. To reset your password, click on “forgot password button”. This will prompt you to enter your username, followed by answering the ‘challenge questions’, which will prompt you the screen to change your password. Please call the parent help desk if you do not have any challenge questions. Note: Only Parent/Guardian contacts are able to use the online registration system. If you have any questions or need assistance with Parent Cloud or Online Registration, please contact Parent Technology Support at 512-414-9187. For any other questions, or any other changes to your child’s file please contact Ms. Gio at 512-414-3478. Don’t have computer access at home? Join us for THES’ Registration Tuesday’s!